Born in 1924, he started his theater career in his 20s and later moved to Hanover, Germany, to study theater and cinema in a boarding school. After graduation in 1958, he returned to his homeland and appeared in over 50 feature films, a number of TV series, and dozens of plays. Entezami was the first-ever Iranian actor to win an international award. In 1971, he received the Chicago International Film Festival’s Silver Hugo for Best Actor for his debut performance in Dariush Mehrjui’s acclaimed movie The Cow. In this film, he played the role of a naive villager who cannot endure the death of his beloved cow and starts to believe that he is the cow himself. Throughout his career, Entezami worked with many prominent Iranian filmmakers including Dariush Mehrjui (eight films), Ali Hatami (four films), Nasser Taqvaee, and Bahman Farmanara, among others. Mr. Naïve (1971), The Tenants (1986), and Hamoun (1989) by Mehrjui, Hajji Washington (1982) and Kamalolmolk (1983) by Hatami, The Blue-Veiled (1994) by Rakhshan Banietemad, and A House Built on Water(2001) by Farmanara were among his most important films. Many Iranians know Entezami for his role in Ali Hatami’s memorable TV series Hezardastan (1978 to 1987). 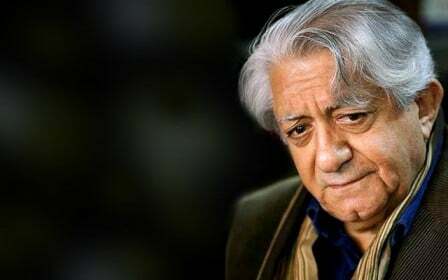 From 1969, when he started his cinema career, to 2010 when he appeared in his last movie, Entezami won four Crystal Simorghs and a diploma of honor from the Fajr International Film Festival. Iran’s Foreign Minister Mohammad Javad Zarif in a message expressed condolences to the Iranian nation and Entezami’s bereaved family over his demise, calling it a source of great sorrow. Zarif also described Entezami as a popular and knowledgeable artist who had dedicated his life to the profession of acting.